Besides imagining and crafting hundreds of fanciful gourd creatures, she also turned gourds into musical instruments and created a band that toured the Midwest. After Eric Ridenour met Minnie’s daughter, he expressed an interest in restoring and enhancing the gourd instruments so they could be brought to life again and be appreciated by a new generation. 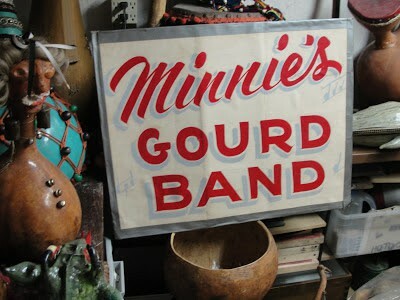 Eric has created the Minnie Black’s New Gourd Band and they play in memory of the legendary Minnie Black. You won’t want to miss this unique musical program!